I’ve been helping aspiring authors for a long time now and one of the issues that new writers always seem very concerned about is how to copyright their work. Being a writer is all about having a great idea for a book. 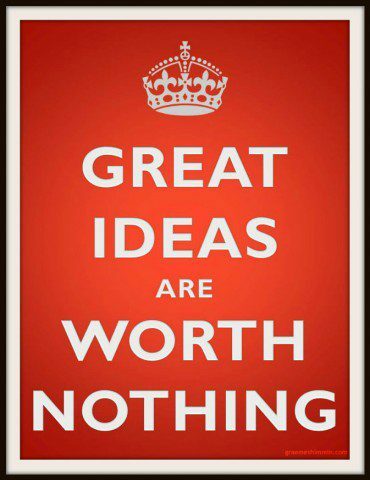 People are going to steal your great idea unless you protect it really carefully. Having great high concept idea is 0.1% of your job as a writer. What? 0.1%? Surely not? Can’t we just phone Random House and tell them our idea and they’ll send a cheque over? Here’s the sad truth: your idea is nowhere near as amazing (and nowhere near as unique) as you think it is and, in itself, it’s not worth anything. It’s not just you, and it’s not that your idea for a story isn’t a good one, it’s that having ‘an idea for a story’ is 0.1% of your job. One of the reasons your idea isn’t as amazing as you think it is, is that stories are always better in your head (or that dream you had) than they are on the page, and all story ideas inevitably suffer as you try to turn them into a real story. I’ve written dozens of loglines and synopsis of highly successful novels. Although they’re good examples of the art of story compression it’s inevitable that when you reduce a story from three hundred pages to one something gets lost. So when you have that earth-shattering idea and write it down, it won’t impress people as much as you think it will. Remember, literary agents and publishers spend all day, every day looking at story ideas. You may think that your idea is super-unique and amazing and no one else could think of it, but you’re probably wrong. The idea that you think has struck you in a blinding flash of inspiration is an idea that has occurred to lots of other people, most likely the ones who were watching or reading the same thing that inspired you. You’re as influenced by the rest of society as anyone else. That’s why it’s called the zeitgeist. If ideas aren’t that important, what is? It’s the implementation of the idea that’s important. What we need to do is take that great idea and turn it into a story. I’ve written several articles about how to start doing that. For example, How to start a story and Spy Novel Plots. People need to realise that worrying about other people stealing your work is something only new writers do. Being worried about people stealing your ideas marks you out as an amateur to anyone you approach. I’ve had a great idea for a novel. If you sign a legal agreement promising to write the story and give me 80% of the profits then I’ll tell you what the idea is. Otherwise, I can’t tell you about my amazing idea because you might steal it. Sorry. What do you think my response to that sort of email is? Hint: I delete it without response. And I’m not even a big name writer. Properly famous authors get this sort of thing all the time. If you look at their websites, you’ll notice that lots of them have statements like “Please don’t contact me about a story idea you had”. Are people really so naïve as to think that a professional writer is going to write their book for them and then ‘split the profits’ just because they ‘had the idea’? Experienced writers know that no reputable literary agent or publisher is going to steal their work – end of story. Because, you know what: that would be illegal. Reputable literary agents and publishers aren’t criminals. And what if the people you’re dealing with aren’t ‘reputable’? Well, if you think you’re dealing with the kind of people who might steal your ideas, why are you doing business with them at all? Personally, I make it a rule not work with criminals. So, having said all that, here’s how to copyright your work. And you’ll be pleased to hear it’s incredibly easy. Copyright is a legal right granting the creator of an original work exclusive rights for its commercial exploitation for a limited time. Note that copyright has limitations and exceptions such as ‘fair use’ and that copyright protects only the original work itself, not the underlying ideas and concepts. ‘Fair use’ is things like quoting a bit of a book in the news, a review, or an academic essay. The fact that copyright doesn’t protect ideas means that, for example, the fact that Ursula K. Le Guin had written a story about a teenage wizard with an unusual scar going to magic school (A Wizard of Earthsea) didn’t stop J.K. Rowling writing a novel about a teenage wizard with an unusual scar going to magic school (Harry Potter). Your work is copyrighted as soon as you create it. Yes that’s right, copyright protection is free and automatic from the moment your work is on paper, or disk, or otherwise put into “material form”. That’s just how copyright works. So all you really need to do to copyright your story is… write it. So, we’ve seen that copyright is automatic as soon as you write your story and there’s no necessity to do anything to make sure it’s copyrighted. There is a slight possibility though that one day you might need to prove you hold the copyright, and one way of doing that, in some countries, is to register your work with a copyright registry. It doesn’t do any harm, except to your wallet, if you register your story with a copyright registry. But note, that registration will only be useful if you end up in a legal dispute over who owns the copyright to your work (and it’s not necessary even then – there are other ways of proving you wrote the story). There’s no government copyright registry in the UK. There are private companies that offer ‘copyright services’, but they have no official status. The USA has a government copyright registry, the Federal Copyright Office. You can register online here. Canada has a government copyright registry, the Canadian Intellectual Property Office. You can register online, here. There’s no government copyright register in Australia. There are private companies that offer ‘copyright services’, but they have no official status. India has a copyright register, the Copyright Office. You can register online here. Do you need to register in all countries? If your country has signed the ‘Bern Convention for the Protection of Literary and Artistic Works’ (and almost all countries have signed) your work is copyrighted across all 162 signatory countries. You might have noticed a statement like “The Moral Right of the Author Has Been Asserted” on the inside front page of a book and wondered if that’s to do with copyright. Moral rights aren’t the same as copyright, though they are related. The main moral rights are the ‘right to be recognised as the author of the work’ and the ‘right not to have your work altered or defaced’. Moral rights are a bit complicated, and vary by jurisdiction, so I won’t delve into them further. It’s not something you need to worry about. What about the © Symbol? is a ‘copyright notice’. It’s not required in order for your work to be copyrighted, but if you have it on your work then a court will not entertain a defence of ‘innocent infringement’ if you do ever sue anyone for copyright theft of your work. Depending on the country, your work loses its copyright protection around fifty to seventy years after you die – by which point you’ll be beyond caring and most probably it’ll be forgotten anyway. Have a look on Project Gutenberg and ask yourself how many of those names you recognise – apart from classics like Sherlock Holmes I bet it’s not many. Don’t be precious about your story ideas. Get on with writing the best story you can. Remember that copyright is inherent in your work. Only deal with reputable literary agents and publishers. This page gives general advice on copyright law as I understand it. I’m not a lawyer and I can’t give definitive legal guidance. Before making any contracts you may need specific legal advice. If you’d like to discuss anything about how to copyright your story, please email me. Otherwise, please feel free to share the article using the buttons below.